Snack Attack Vending LLC is offering a Dixie Narco "E" series Single & Double Column 16.9oz Bottle conversion kit. This is for the Dixie Narco drink vending machine models 501E & 600E. 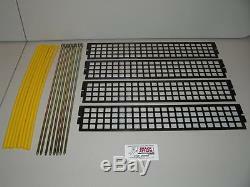 The set consist of (8) single column rods & yellow sleeves and (8) double column plastic shims (4 shims on each side). This Shim Set is brand new from factory. Power down machine before installing shims. Start by adjusting the single brown vend motor cam discs. Lightly pull disc tab towards you and turn disc clockwise to #5 hole snaps in. You should have 2 notches on disc for 2 deep bottles. Then Adjust double wide column red/grey disc to #3 hole snaps in. You should have 4 notches around disc for 2 deep bottles. Power machine up and pull out white door button located between coin mech & bill validator. This will reset vend motor cams. Now vend each single column brown vend motor so that the rotor cup is in the right, 5:00 o'clock position. This will allow you to insert rod & yellow sleeve in rotor cup holes from above can ramp. Insert the rod & sleeve first holes towards you. Then take your 16.9 oz bottle and slide in between rotor rod and metal shim to make sure that bottle will sit in there without dropping down. Insert double column plastic bottle shims 3 or 4 on each side. The item "DIXIE NARCO 501E & 600E SODA VENDING MACHINE 16.9oz BOTTLE CONVERSION KIT" is in sale since Sunday, May 3, 2015. This item is in the category "Business & Industrial\Restaurant & Food Service\Vending & Tabletop Concessions\Beverage & Snack Vending\Parts & Accessories". 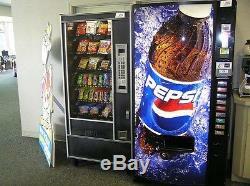 The seller is "rhershey24" and is located in Manheim, Pennsylvania. This item can be shipped to United States.